The news of the deployment of a THAAD missile defence system in South Korea is creating tension and conflict in the region. Despite ongoing concerns, the United States works with the country to get the system operational as a security measure against unpredictable North Korea, China is lashing out in protest over the issue. To voice its disagreement, China is taking aim at South Korea’s economy at several different ways that could have disastrous consequences for the country. As South Korea’s most powerful neighbor, China has the power to influence South Korea’s economy in a number of ways. For example, Chinese tourists make up the majority of tourism revenue for South Korea. So, by the country launching a boycott and prohibiting group tour groups from organizing trips to South Korea, they are taking more than $7 billion from the economy. Not to mention, the $11 billion that comes from Chinese individuals travelling to South Korea on their own. The Chinese travel boycott is able to deal out some serious damage to the South Korean economy. But, the country did not stop with this single unofficial sanction. Barron’s reports that China also suspended Lotte Group’s supermarket operations in the country. This South Korean based company will inevitably feel the blow from this suspension. Political analyst also explain that more sanctions could be to come, including smart phones and car makers. These unofficial sanctions could have the ability to cripple South Korea’s economy. 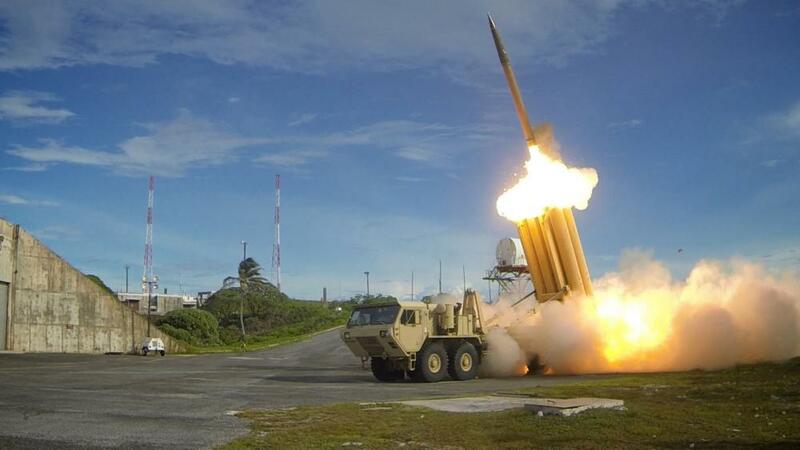 However, it seems as if the THAAD missile defense system provider could also have some negative effect on the country’s economy as well. In late April, President Donald Trump remarked that he expected South Korea to pay the bill for the billion dollar system. Not only does the president think the country should pay, but he threatened to kill the free trade deal between the two if they refused to comply. However, South Korea does not believe they should have to pay. The country’s Defense Minister Han Min-Koo explains that his country was doing enough for the defense system. In fact, the country explains that they signed an agreement that the United States would bear the full cost. “There has been no change in our basic position that the South Korean government provides the site and infrastructure for THAAD … and the U.S. side shoulders the cost of its deployment, operation and maintenance,” the Defense Ministry said in a statement. As the South Korean government remains adamant, it seems as if President Trump will back off from his earlier claims. However, only time will tell if the system will eventually affect the free trade agreement in the future. The “reform” of this agreement could have consequences on the South Korean economy, as well. Under the United States-Korea Free Trade Agreement, also called KORUS, South Korea is the United States sixth largest goods trade partner. If President Trump were to follow through with his suggested renegotiating of the free trade deal, South Korean exporters would find themselves in a financial bind. The almost 3 percent drop in exports would lead at least .4 percent of South Korea’s GDP to disappear. It is important to point out that the United States-Korea Free Trade Agreement is not perfect and could stand to have some reforms. There are some cons, but a full scraping of the deal would still have drastic consequences. The South Korean economy has become accustomed to uncertainty due to the actions of North Korea and the impact that this has on other countries’ relations with the region. The economy has flourished by exporting a number of goods from high tech electronics to automobiles. However, the rising tension of the THAAD issue is causing some consumer concerns. The typical South Korean consumer confidence is already fragile and sales are slightly down as the country recovers from 2015’s MERS outbreak. Many consumers avoided public areas, meaning less dollars were spent. As the country slowly continues to recover, the conflicts of the region could further hinder progress. With South Korea in the process of becoming a country surrounded by its enemies, one possible step it may take in the future is to re-approach its relationship with China. During a telephone conversation between the South Korean Prime Minister and the Chinese President on May 11th of this year, Chinese President Xi Jinping did not hide his intentions in wishing to draw South Korea in by seeking to stop THAAD and calling for an earlier summit meeting. The left wing, pro-North Korea Chinese President shares only anti-Japanese sentiment with the South Korean leader, with both leaders citing domestic public opinion to seek the annulment of the Japan-ROK agreement (concluded at the end of 2015), which was finally thought to have put an end to the historic problems between South Korea and Japan. For China, this year marks the 80th year anniversary of the Nanking incident, leading to speculation that the country will rewrite history to suit itself, and continue to spread its anti-Japanese propaganda across the world. In cooperating with one another in making anti-Japanese propaganda, and unable to accept that “barbaric” Japan (in accordance with the Sinocentristic ideology) ever stood above them historically, the possibility of China and South Korea returning to their former student-teacher relationship is high. No matter the economic outcome of the THAAD missile defense system, political analysts believe that the system is detrimental to helping create a more secure region. As North Korea continues its missile test and building of its nuclear program, these experts warn that measures need to be taken to build a form of defense for an unpredictable future, no matter what the potential costs may be. Good writing, Jess. However please be aware that the boycott of South Korean goods are quite spontaneous not as implied acting like robots guided by programs of Central government. Most if not all inspection on Lott markets have been lifted but sales are still horrible. Even if THAAD is completely withdrawn tomorrow, it will still take time to regain Chinese people’s good will. The auto sale of Korean cars in China is down 60%. So, my observation is that only China can protect South Korea and North Korea in a military and economic sense. USA can only make troubles and possibly bring catastrophe to the Korean Peninsula. So, the Koreans should wake up and save their arrogance toward China and not to be harmed by their vanity. Go back to learn from the well of Confucianism. Or to be true Christians with humility like Christ the Lord who preached: “The meek shall inherited the earth”. Why would China protect both when North Korea and South Korea are butting heads in a sense.